There are many great accessories for helping you get your kitchen cupboards in shape. Most organizing gadgets can be easily installed with a cordless or electric drill. Baskets, spice racks, wine glass holders, cutlery drawer inserts and pull-out trash cans can make your kitchen a much happier place to work in. There are many different kinds of lazy susans that can be installed in various places to help you get more organized in your kitchen. There are permanently attached units and also free-standing carousels that work perfect for organizing things in upper cabinets and also under sink areas. Selections of white plastic, chrome plated and real wood designs are available in many different sizes, styles and price ranges. Some units swing out on a pivot and others are designed to slide out. There are half-moon designs and full-round units. There is one thing that can be installed without the use of tools. These are adjustable shelves for under the sink area. This item is perfect for rearranging soaps, dish-washing liquids, cleaning supplies and things like bug spray in order for the area to be neatly organized. Pot scrubbers, Scotch Brite pads, SOS pads, boxed detergents, silverware polish and many other items can be easily accessed once this unit is installed. There are wire baskets that were designed to help with organizing clutter in any cabinet area of the kitchen. These units come in a large selection of styles and sizes. The can usually be installed with two to four screws. Sometimes an additional panel is needed to mount the accessory to because of where the screw locations are in relation to the raised panel design of some cabinet doors. There is also a very nice grocery bag storage unit that can be installed on the back of cabinet doors. It can be installed with double stick mounting tape or screws. There are hundreds of spice storage products on the market. 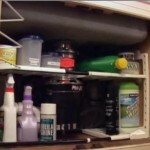 Some get fastened to the back of cabinet doors and others fit inside of drawers. There are turn-table spice racks and slide out units. Some holders are even designed to be mounted on the wall or underneath an upper cabinet. These are wonderful additions to have in your kitchen. They can be installed in a matter of minutes and are supplied in hundreds of styles and sizes. There are a few roll out trash unit disadvantages that I learned about from having one in my home. If you have kids, just know that they have no mercy on these gadgets used for organizing kitchen cabinet areas. The best product I’ve found, at a reasonable price, for straightening out kitchen cabinet drawers is an adjustable drawer cutlery insert. These little units allow you to not waist an space. They expand to fit tightly to the inside of the drawer area. Refer to this article about Kitchen Pantry Cabinet Ideas. There are many different styles and size roll-out units specifically designed for organizing tall storage cabinets. Roll-top cabinets work great for organizing the counter-top area of your kitchen. They are wonderful for small kitchen appliance storage or just about anything that you want to be able to conveniently access, but do not want to be seen on the countertop. 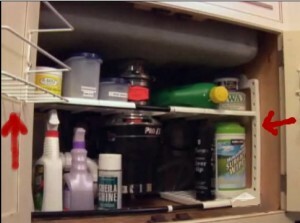 Those are by far the most common accessories that people use for organizing their kitchen cabinet storage areas. There are reputable places to purchase cabinet hardware online. Most of the items mentioned in this article can be shipped within a period of a day to three weeks depending upon if it is a special order item or not.